Members of the Green Gym split into three groups. Some did litter picking. Another group improved the path. Some dug up the surface, and others poured on the wood chip and tamped it down. The third group cleared the ground to plant trees. 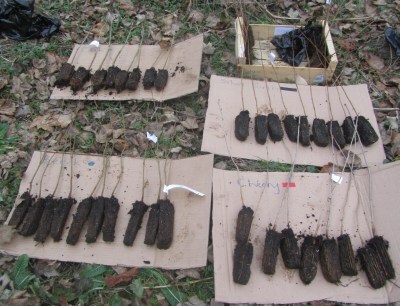 There were about 35 small saplings: oak, beech, silver birch, and cherry. 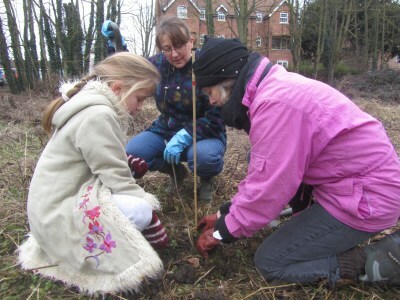 The saplings were then dug in next to a cane and surrounded by a protective guard . A red spot on the cane means this one is a cherry. All were plotted on a map to monitor how they do. How can I get involved with this? I walk down the Ock most days with my dog and can spare some time to help with clearing etc. 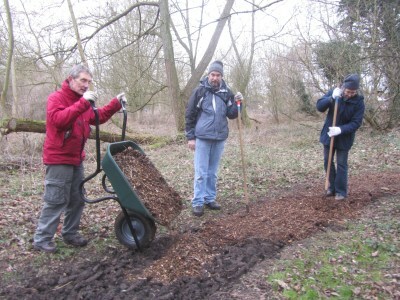 They have a website at http://groups.btcv.org.uk/abingdongreengym/ – their future events and contact details are on there. I was so pleased to see tree planting on the Ock walk, this is just behind my house, and will improve the area a great deal, as long as they thrive. We will be back in March and my husband and I would be only too happy to keep an eye on the young saplings. I walk my cavalier along the walk everyday, it is a joy to behold and a real asset for the area.